Aquilegia foliage is charming any time of year -- but particularly welcoming in the December garden when many other perennials have already died back for the year. 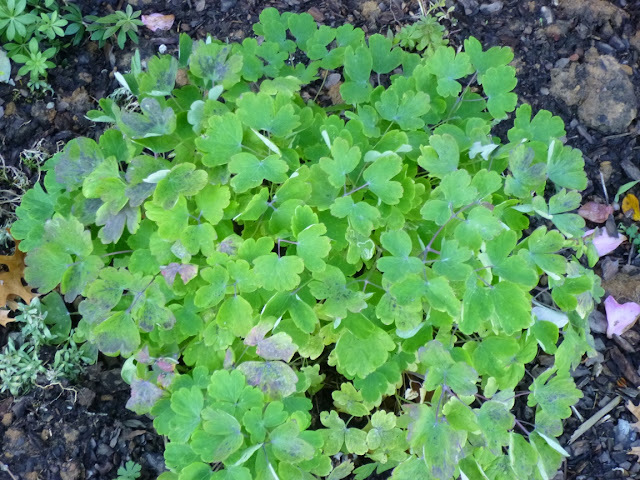 From my experience, if Aquilegia foliage ever looks too tattered, cutting it back near the ground will stimulate a quick and vigorous flush of beautiful new leaves. But then I decided I'm going to double-down and try to plant more aquilegia next spring. This time I'll be adding the species, not the Winky type I already have. The species is supposed to do a better job attracting hummingbirds and self-sowing itself. But what I'm really liking about aquilegia right now is its green, cheerful foliage. It's true that we have not had a particularly cold winter yet (it was in the 60s again today), but nonetheless at a time when nighttime temps in the 20s have killed back many of the other perennials, it is nice to see aquilegia's fresh leaves still looking great. Plus, I've come to really appreciate how long-lasting foliage can shelter the soil and thereby deter weeds. Do you grow aquilegia? If so, when/how do you prune the foliage? Sooner Plant Farm suggests cutting back the leaves in early spring, so I'm thinking maybe I'll cut all the stems back to 1-2 inches in late February or early March. I'm not too worried about over-pruning aquilegia because I already cut these plants all the way back twice in the summer when the foliage looked tattered and exhausted and the plants quickly responded with a burst of pristine new leaves that seemed healthier than ever. Also, many sources (including this At Home in Sussex County blog) describe aquilegia as being a short-lived plant (often lasting only 2-4 years). Has that been your experience? Have your aquilegia plants self-sowed? Finally, if you have had success with aquilegia, which type would you describe as your favorite both in terms of performance (flowers, foliage, lifespan) and quantity of self-sowing? Want to see how all the aquilegias fare in my Tennessee garden? You can subscribe by email. Aaron, Aquilegia is probably my favorite perennial, or at the top of the list anyway. I have only cut back the ones I have for sale after they have bloomed and, you're right, they do come back looking brand new and sometimes they will bloom again. I've never cut back the ones in my garden because there's never been a need to. Occasionally, some will get leaf miner, but leaf miner isn't really detrimental to the plant, and it doesn't bother me a bit. My favorite Aquilegia is Aquilegia canadensis, our native Columbine. That will always be number one for me, but I also love and grow many other varieties, but they are all species varieities, not the cultivars with the cute names. I try to avoid those; I guess you might say I'm a purist. 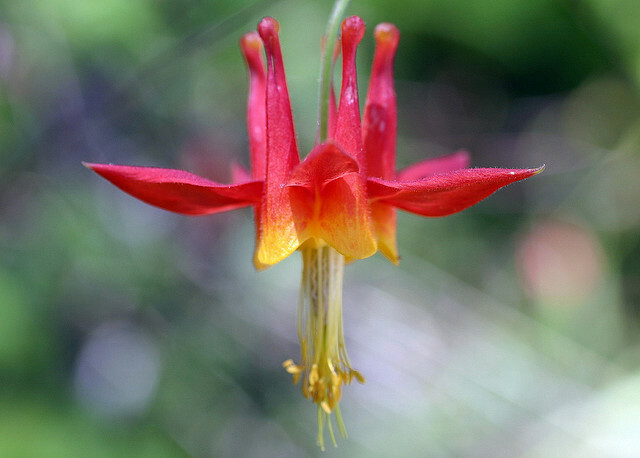 Columbine is not long lived, but what does that mean anyway? Sometimes people think that perennials live until the end of time; they don't. It only means that it is not an annual, not a biennial, not monocarpic, etc. Technically, I think that it means that they live more than two years, so if a lives three or four years, I would say that's a pretty good show. Aquilegia vulgaris reseeds the best for me, and with all the different colors, you can get some nice variations each year. If you ever want to sow your seeds in another place, it's important to remember that Aquilegia seeds need light to germinate, so just scatter them on the top of the soil. Thanks for your great comment, Dottie! This may be an obvious question, but when you say you never cut back the aquilegia in your garden, if you don't touch it in the fall will it simply die back in the winter and then (hopefully) resprout in the spring? I think I'll try both A. canadensis and A. vulgaris next year and report back on which one does best here in Middle TN. Aquilegia canadensis would probably do great where you live. Many years ago, while walking in the woods, I ran across a huge area of this native Columbine, all blooming at the same time. It was a most beautiful and unexpected sight, and I have tried to duplicate that ever since but with little success. Of course, mine reseeds but not as much as I would like. On the other hand, Aquilegia vulgaris does reseed more readily, but I still prefer the native variety. Both would do well for you in Tennessee. Thanks Dottie. I too will keep a close eye on aquilegia this winter to watch how the foliage dies back and then gives way to new growth in the spring. Perhaps I'll try to document the process on this blog.